Beyond Software's Accounts Payable functionality ensures timely processing of vendor payments. Beyond Software’s Accounts Payables functionality makes it easy to develop and maintain a long-lasting relationship with your vendors. From document entry to vendor payment, your outstanding vendor balances are kept up to date for accurate reporting or lookup at any time. You have the option of printing checks or recording manual payments. Out of the box reporting and consoles allow easy lookup of vendor records or auditing to quickly analyze outstanding vendor balances, payment and discount history. Timely processing of vendor payments. Payment selection, by invoice due date or discount due date, allows you to choose which invoices to pay and when. This allows optimum management of cash flow. Checks can be printed to paper or electronically and if an error is identified on an invoice, the invoice can be reversed, edited and then re-issued for the correct amount. Automation of your payables management. Management of your cash flow with increased financial control. Definition of unlimited number of vendors, vendor classes, terms, and due dates. Lookup of vendor activity and drill down to the original transaction for any Payables document to trace the flow of a transaction through the system when needed. 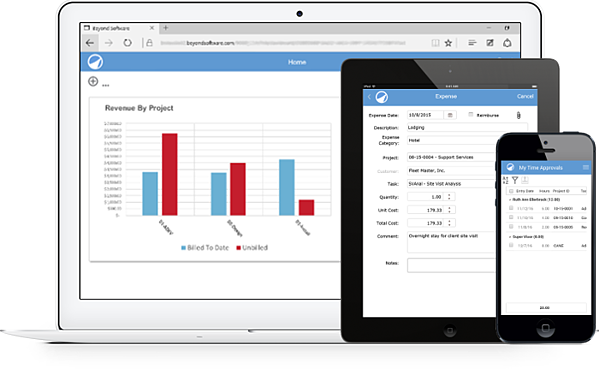 You to quickly and easily conduct powerful reporting on vendor activity with flexible reports and consoles, that provide relevant insight into your Accounts Payable process, with the option to export the data to Excel for further analysis. You can set up an unlimited number of vendors in Beyond Software. Ability to define vendor classes, terms, and due dates (invoice due date and discount due date). Enter vendor invoices, adjustments, and payments with ease. Distribute payables amounts to multiple accounts or subaccounts. Support for 1099-MISC reporting, as well as support for check printing or manual check entry. Easily track vendor history and simplify the payment selection process. Ability to drill down into the original transaction for any Accounts Payable document. Standard reports for Vendor Statement, Vendor Trial Balance, Vendor console, and Vendor Activity console.